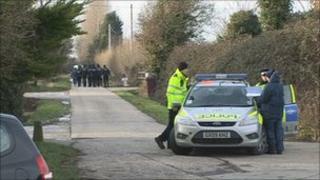 Police are still questioning a man arrested on suspicion of the murder of a man whose body was found at a plant nursery near Chichester. The body of a 45-year-old Romanian man was discovered off Almodington Lane, Batchmere, on Sunday. Sussex Police were granted another 36 hours on Monday to hold a 53-year-old man, also from Romania, who was arrested in connection with the death. The victim was discovered with several stab wounds. A post-mortem examination is expected to be carried out later. The force said officers had been at the scene since Sunday and searches of the nursery and the surrounding rural area were continuing. Det Ch Inspector Nick Sloan said: "We are keen to speak to anyone who was in the Bracklesham Bay or Birdham areas, not far from Selsey, late on Christmas Night who may have spotted anything or anyone acting suspiciously."